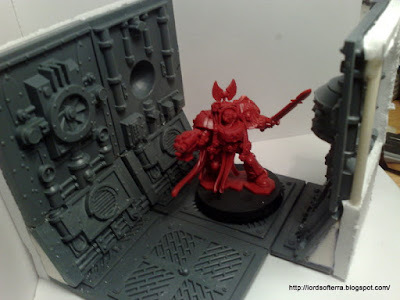 This is my first attempt of creating a 3D man for space hulk, this is basically what a bunch of other people already did using the Manufactorum pieces as space ship corridors. My biggest concern was to have the corridors big enough for the models to move freely inside, as you can see below there is some extra space between the wall and the central catwalk. I have to do some filling using the green stuff and then I'll cast a couple of molds!